This guide was written in 2011 by education and social care professionals from France, Italy, Romania, Iceland and the UK and is based on evidence and learning from each of these countries about what works for the inclusion of disabled children and young people in mainstream education. 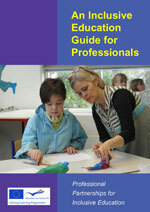 The guide offers practical advice and information to those professionals already working with disabled children and their families and also to those professionals unfamiliar with this area of work. It is based on learning and evidence from visits to each of these countries and was funded by Leonardo.